Welcome to the World of Michael Trent, a crazy American artist living in the countryside of Sao Paulo, Brasil. A person in love with paper, stencils, rubber stamps, and markers. The creator of StenDoodle, a technique that merges stencils with doodling. I hope you enjoy your time in my World! As soon as I saw the sketch I knew exactly what die I was going to use and I knew that I wanted to make an Easter card that has been itching to get out of my system for months now. I am using a stamp called Buttercup by Unity Stamp Co. that I bought in 2015, to make cards for Easter in 2016, which never happened! LOL So I am using it this year for some of my cards. I started with a top folding A2 sized card of white cardstock. To the front I adhered a piece of patterned paper and distressed the edges with Vintage Photo distress ink. 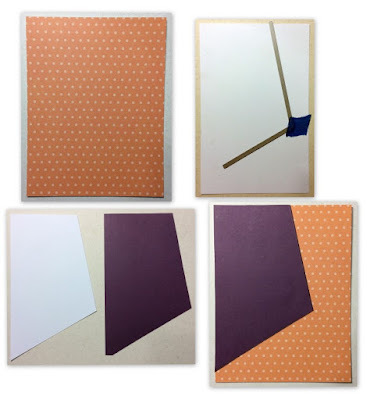 Then I used the angled die from the Custom Panels Elle-ments Die by Avery Elle on a piece of dark purple cardstock and on a piece of white cardstock. I cut them so that there is about 1/8" border. I distressed the edges of the dark purple cardstock and adhered it to the card front. Then, using the piece of white cardstock and a stamp positioner, I stamped the image of Buttercup the bunny in black ink. I also stamped two of the eggs on a piece of scrap white cardstock. Then I colored them all in with a variety of Copic markers. Lastly, I distressed the edges and adhered the white cardstock to the purple, adhered the eggs with some pop dots, stamped the phrase on a piece of orange cardstock, which I cut using the Word Window Punch (Stampin Up, Retired) an d adhered this also with some pop dots. 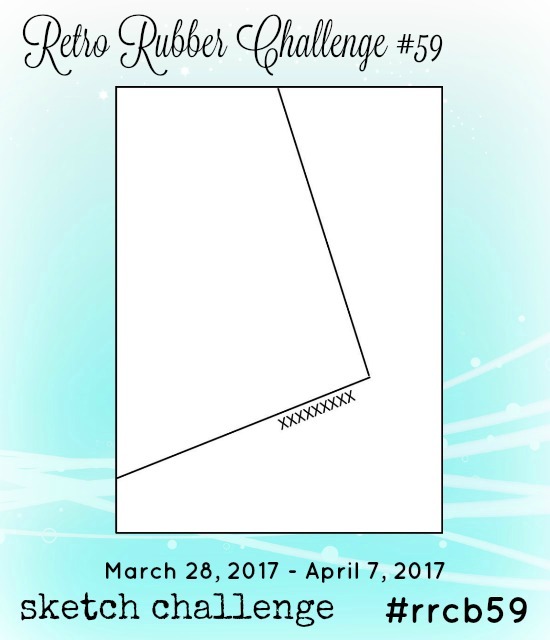 Labels: #rrcb59, Card, Easter, Retro Rubber Challenge, Unity Stamp Co. Happy St. Patrick's Day/TGIF/Retro Rubber Challenge No. 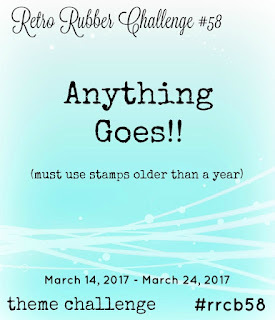 58 - Anything Goes! Hello everyone! TGIF.....Happy St. Patrick's Day 2017....happy everything. OMGosh...so many things going on here at once. I got a job for a cafe/bakery in town. They are making their own handmade chocolate Easter eggs and they asked me to make bands to go around the boxes. 200 of them. When I am done I will show it all. I am also taking part in an ATC swap. Not only is it my first swap but I have never done an ATC before. It's been a lot of fun and I cannot wait to finish them all to show you guys! But free time has been tight. But for today....it's Retro Rubber Challenge Blog Day. I am thrilled to say that I was their top pick for last week's challenge!! Thank You Retro Rubber! All the cards entered rocked and I am honored to have won. I will be a guest designer for them on an upcoming challenge. You can check out the winning card HERE. For this week's Retro Rubber Challenge No. 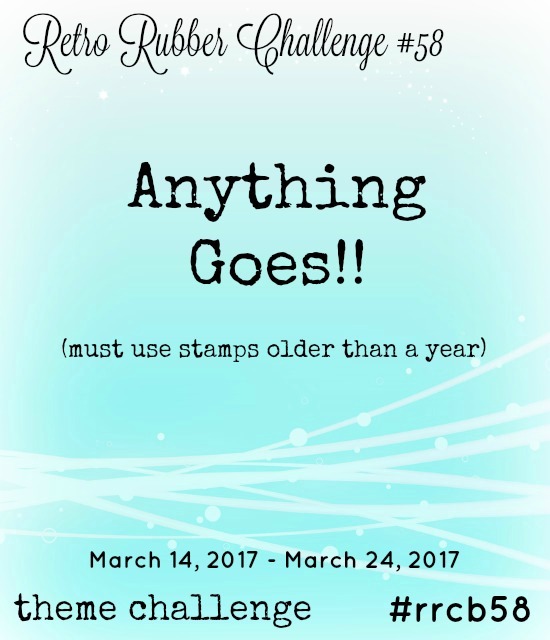 58 it's an Anything Goes challenge. Last week I pulled out a stamp by Hero Arts that I wanted to use and, since I had some Kraft paper laying about, I decided to throw the two together for today's card. All the stamps in this post are at least two years old and the ink was still in the packaging and is now discontinued by Hero Arts. LOL. I started with a top folding A2 card base of white cardstock. I then pulled out a piece of Kraft cardstock and stamped the Hardwood background stamp (Stampin Up) using Latte Chalk Ink by Hero Arts. Once dry I trimmed it to 4.25" x 5.5", distressed the edges with the Latte chalk ink, and adhered it to the card front. Next I cut another piece of Kraft cardstock and stamped/embossed Leafy Vines (Hero Arts) using Versamark ink and white embossing powder (Hero Arts). Next I trimmed the Leafy Vines to 3.75" x 5", distressed the edges with the Latte chalk ink, and adhered it to a piece of black cardstock, 4" x 5.25". I then cut a piece of black fun foam, adhered this to the back of the black cardstock, and then adhered this to the card front. You will have 4 layers. Lastly, I stamped the words "Just" and "Because" from Label Maker Sentiments (My Favorite Things) in Onyx Black Versafine ink on white cardstock, trimmed both the words, adhered them to Kraft cardstock, distressed the edges and adhered to the card front using some small pop dots. Done!! A pretty easy card to make and with the Label Maker set, you can use whatever words best fit the occasion of why you need the card. A great set to own! I hope you liked this card. 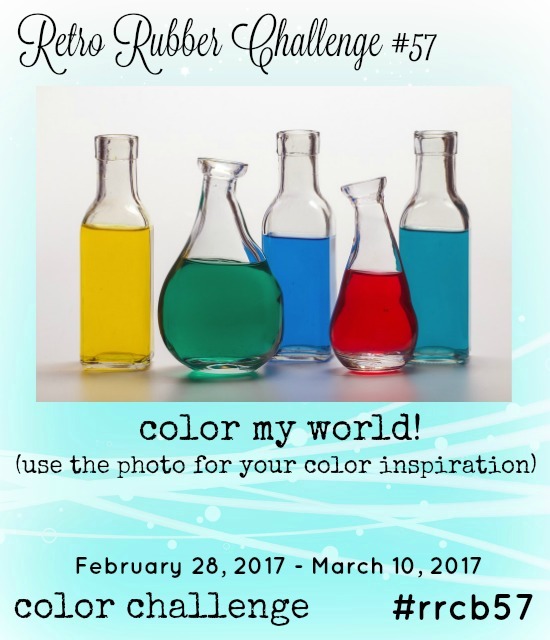 If you want to take part in the Retro Rubber Challenge, you have until March 24th to enter a project. Just click HERE to enter one of your own. Hello everyone! I love it when the planets align and I have the opportunity to use a project in more than one place! Two things happened this week in my favor. First - the 7th "30 Day Coloring Challenge" started over on The Daily Marker. I always stress out over these because I really want to do something each day but always fail. This time I am just going with the flow. If I make something, fine. If not, no big deal!! And, the current Retro Rubber Challenge - Challenge 57 - is all about color! I had to use the photo below for inspiration. I had two ideas in my head. One was a vertical card and the other was a horizontal card. I decided to use an older (like from 2007) stamp by Penny Black called tigress (3817K), which is still being made (YAY), and some Bic Markers in the colors from the inspiration photo. For the horizontal card I started with an A2 card base of white cardstock. I then cut another piece of white cardstock, 4" x 5.25", and stamped the image of the twice (yes, I used a stamp positioner). I then stamped the phrase "Thanks A Bunch" from THIS Dear Lizzy stamp set. I then colored the flowers in using Bic Markers - Rambunctious Red, Blue Skies Blue, Key Lime, Hot Aqua, and Yellow Blaze. I then adhered a piece of white fun foam to the back and then adhered this to the card front. The last thing I did was to apply some Stickles to each of the flowers using True Blue, Firefly, Xmas Red, and Yellow. For the vertical card, I also started with a top folding A2 card base of white cardstock. I then cut another piece of white cardstock, 4" x 5.25", and stamped the tigress stamp in the lower right side. I then stamped the phrase "you color my world" by Viva Las Vegas Stamps, next to the flowers. I colored the flowers with the same Bic Markers, applied the same Stickles to each of the flowers, adhered a piece of white fun foam to the back and adhered this to the card front. That's it!! I love how these primary colors pop off the card. Very clean and simple! 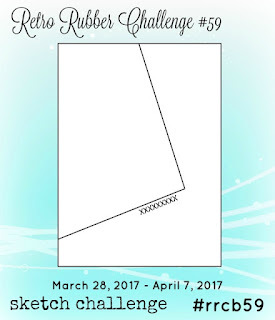 I hope you get a chance to check out the 30 Day Coloring Challenge and maybe you can even make a card for the Retro Rubber Card Challenge! Happy New Year and OH MY GOD, I TURNED 50!! Sunday Coffee with Deb and Celeste and a Card and Stickers!